From our campsite on Phillip Island, we literally had to only walk about 20 steps to reach the chilly sea. The location was perfect for our first “glamping” experience! As we approached our tent, soft, relaxing music filled our ears. Nearby, children on holiday break played on the beach. The sun was shining and everything seemed alright with the world. Up until this trip, I had never ever been glamping, but hubby and I had been camping several times when we lived in the D.C. area and separately as children. I had read about this trend of “glamourous camping” before (particularly popular in Africa), but I had no idea what to expect when we decided to take a break from Melbourne and spend a weekend glamping near the beach. What we loved best (besides the fab beachside location) was that the tent was outfitted with the comforts of home – fringed rugs, a comfy queen-size mattress with sheets, pillows and a blanket, magazines to read, real plates and cutlery, a radio, an electric tea kettle and heater, a butane gas-burner stovetop, a lounge chair and even a cute dining set for two located outside our tent. We could even stand up in our tent! This was a far cry from our previous camping experiences together, although we did use a blow-up mattress underneath our sleeping bags the last time we camped. Also, I didn’t have to hunt for firewood, and we didn’t smell like a campfire the next day. 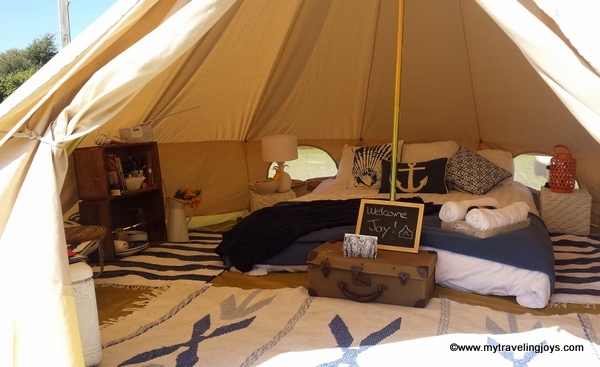 The local couple behind this new enterprise is Serena and Alejandro Cabello, who started Phillip Island Glamping in July. Prior to our arrival, I had been in touch with Serena several times about how glamping worked, whether dates were available and at what location. 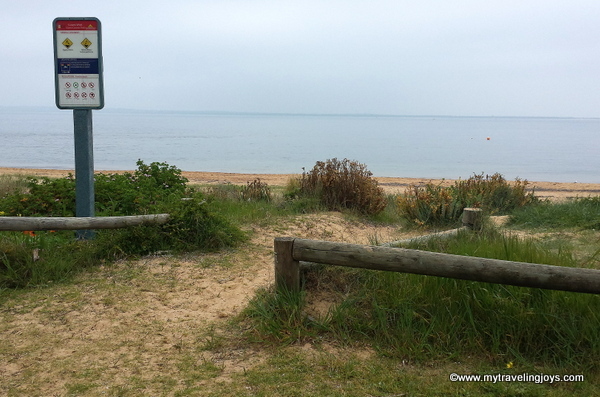 I selected the Cowes Caravan Park because of its beachside location. (Two sites also are available near the town of San Remo.) Next, I reserved and paid 40aud for site 179b via the campground and paid Serena 140 aud to set up the tent and all its fixings. Our total cost was 180aud (about $125) which was cheaper than boutique hotel rooms on the island. The whole booking process was so simple! We spent a sunny afternoon strolling along the vast beach in front of our campsite, heading 2km away toward the Red Rocks Beach, which is aptly named after its gigantic red-colored boulders near the sea. I couldn’t believe how natural this stretch of beach was – totally unharmed from development! 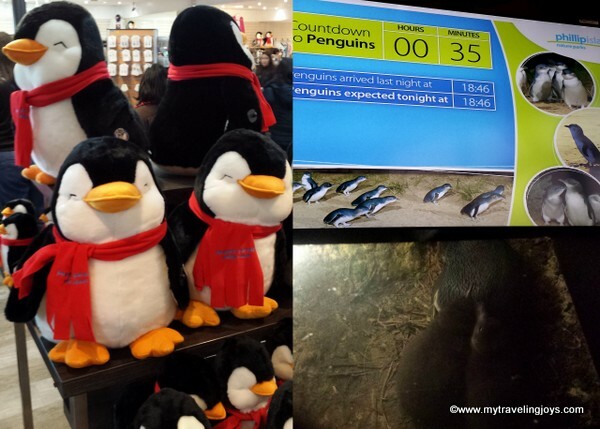 Before sunset, we headed to Phillip Island’s main attraction – the Penguin Parade. At dusk, hundreds of Fairy Penguins waddle in from the sea after spending the day fishing for food for their young. We plopped our butts down on the damp sand for a near-front row experience. The penguins look so adorable as they scrutinize their surroundings, deciding which way to go and how to avoid the annoying seagulls so they can reach their burrows again. During the Penguin Parade, you aren’t allowed to take ANY photos so you don’t scare the penguins. However, you can see some cute penguin photos here, and the chicks look like they are waving at you. A few penguin shots. Bottom right, you can see the furry outlines of two new chicks in their burrow. Our campsite was cloaked in darkness and peacefulness by the time we reached it. Hubby and I nibbled on some local cheese while we cooked a simple dinner of Italian sausages with baked beans. Not our finest meal, but it was doable considering one of us had to hold the flashlight (or torch) while the other cooked and plated. But we had wine and the black sky twinkled with thousands of stars. We rarely see stars in the city! What a beautiful sight! Cooking at night at our glamping site on Phillip Island. Classy stuff! In the morning after our sunrise hike to The Pinnacles, we cooked up bacon and over easy eggs which we enjoyed with some leftover lentil salad and local cheese. If you’re craving coffee, just pop into Cowes and grab a take away coffee from one of the many cafés. 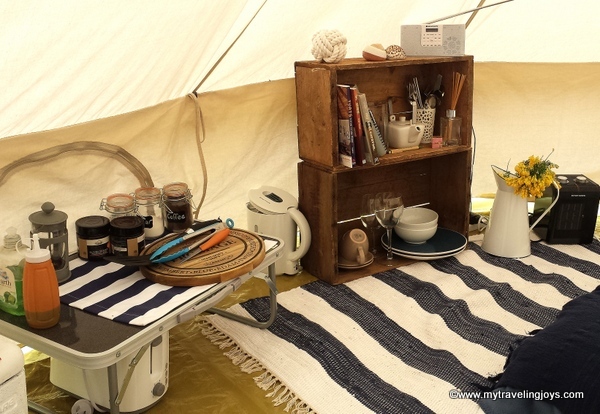 For us, glamping was the perfect way of getting our outdoor fix without compromising on comfort, especially as the temperatures dipped down at night and we turned on the electric heater. We enjoyed our first Australian glamping experience so much that I’m already looking for other locations around the country! Have you been glamping before or would you like to try it? Wine + glamping = a winning combination! This cute fairy wren visited our campsite in the morning. glamping is a big thing around here these days too. i think it is a bit rougher than i like! This looks like my kind of camping. The first time I slept in a tent, I had to scrape squashed slugs off the ground sheet afterwards. There wasn't a second time. @annie, well that doesn't sound like fun! I guess I grew up w a bit of camping as a kid so I don't mind. This is really an interesting mode of holiday for those who simply love the outdoors but do not want to sacrifice on comfort especially when they have young children or old folks in tow. The price also seems reasonable with all those ready amenities prepared for the guests. I just thought there should have been a special storage space for personal or sensitive belongings though.